Location of Hawthorn Woods in Lake County, Illinois. Hawthorn Woods is an affluent village in Fremont and Ela townships in Lake County, Illinois, United States. The population was 7,663 at the 2010 census. 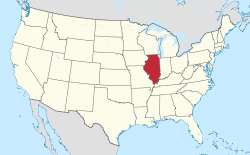 The village is located approximately 40 miles (64 km) northwest of downtown Chicago. It was officially incorporated in 1958. Major transportation arteries include Midlothian Road, Old McHenry Road, Algonquin Road, Halfday Road, and the Elgin, Joliet and Eastern Railway. The new Hawthorn Woods Country Club, whose golf course was designed by golf professional Arnold Palmer, is located within the village's perimeter. Hawthorn Woods is located at 42°13′41″N 88°3′19″W﻿ / ﻿42.22806°N 88.05528°W﻿ / 42.22806; -88.05528 (42.228306, -88.055319). According to the 2010 census, Hawthorn Woods has a total area of 7.926 square miles (20.53 km2), of which 7.71 square miles (19.97 km2) (or 97.27%) is land and 0.216 square miles (0.56 km2) (or 2.73%) is water. As of the census of 2010, there are 7,663 people, 2,560 households in the village. The population density was 1,119.9 people per square mile (432.3/km²). There were 1,848 housing units at an average density of 344.8 per square mile (133.1/km²). The racial makeup of the village was 94.55% White, 0.07 African American, 0.02% Native American, 3.10% Asian, 0.07% Pacific Islander, 0.57% from other races, and 1.00% from two or more races. Hispanic or Latino of any race were 2.07% of the population. There were 1,831 households out of which 55.3% had children under the age of 18 living with them, 89.2% were married couples living together, 3.1% had a female householder with no husband present, and 6.7% were non-families. 4.2% of all households were made up of individuals and 1.0% had someone living alone who was 65 years of age or older. The average household size was 3.28 and the average family size was 3.39. In the village, the population was spread out with 33.6% under the age of 18, 4.6% from 18 to 24, 28.3% from 25 to 44, 29.1% from 45 to 64, and 4.4% who were 65 years of age or older. The median age was 38 years. For every 100 females, there were 101.1 males. For every 100 females age 18 and over, there were 98.8 males. The median income for a household in the village was $132,720, and the median income for a family was $134,034. Males had a median income of $100,000+ versus $55,156 for females. The per capita income for the village was $49,346. About 2.1% of families and 1.9% of the population were below the poverty line, including 1.4% of those under age 18 and 5.1% of those age 65 or over. n terms of quality of living and overall goodness, Hawthorn Woods ranks #216 in the State of Illinois. Dominick Basso, bookmaker for the Chicago Outfit. Basso lived in Hawthorn Woods from at least the 1980s until 1999. Anthony Castonzo, offensive tackle for the Indianapolis Colts. He was raised in Hawthorn Woods. Nancy Faust, organist for the Chicago White Sox from 1970 until her retirement in 2010. She is a resident of Hawthorn Woods. ^ "Geographic Identifiers: 2010 Demographic Profile Data (G001): Hawthorn Woods village, Illinois". U.S. Census Bureau, American Factfinder. Retrieved December 11, 2012. ^ Goldsborough, Bob (March 21, 1999). "Celebrity FSBO - Ex-Bear Rivera, wife go it alone in selling home". Chicago Tribune. p. 5. ^ Katzman, Josh (May 13, 2011). "Waiting to Play". Lake Zurich Patch. Retrieved February 2, 2018. ^ Column: My encounter with Nancy Faust, longtime White Sox organist - Barrington Courier-Review Retrieved 2017-02-25. This page was last edited on 29 December 2018, at 15:28 (UTC).